The US Air Force Research Laboratory (AFRL) in Ohio, has announced an emerging capability for growing gallium oxide semiconductors. The new Oxide MBE laboratory is said to be a first-of-its-kind capability within the US. “This is the first system of this kind specifically designed to grow gallium oxide, which is a promising new material for high-performance electronics,” said Materials research engineer Don Dorsey. What this means for aircraft electronics is that current components that are necessarily big and bulky could be made much smaller and lighter. Dorsey likens this to today's common laptop voltage converters. “A simple example is the power adaptor located on the cords of laptop computers. We think the promise of this is that you could get rid of that entirely and have a small component on the circuit board that would do the same job.” Dorsey explained that the AFRL team's work is geared toward similarly reducing the weight and size of Air Force systems. What makes AFRL's Oxide MBE Laboratory ideal for this this type of materials research is that it is specifically and solely designed for the growth of gallium oxide. As Dorsey explained, contamination is a critical factor in the growth of quality crystals. Since the new MBE chamber will only be used for gallium oxide, there is no chance of cross-contamination that could degrade the material quality. According to AFRL materials researcher Shin Mou, the MBE Laboratory also equips AFRL to bridge the gap between university and industry research efforts. 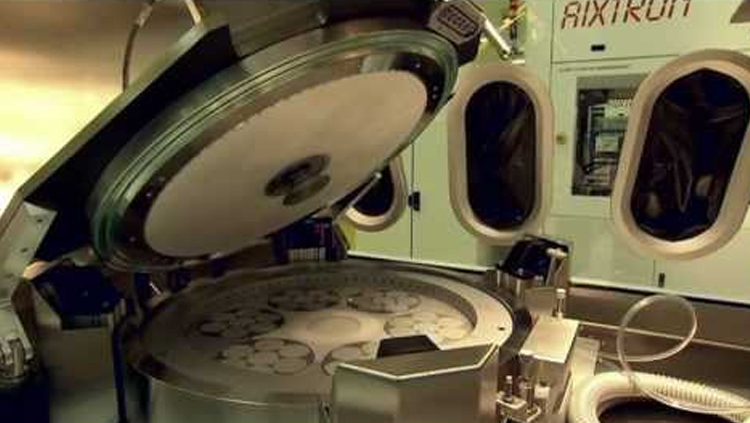 “The capability to produce up to four-inch wafers enables us to work with university Centres of Excellence as well as industrial research organisations to advance the material capabilities and open new doors for this technology.” He explained that AFRL will be able to pull from the research conducted within academia, put the fundamental understanding into action to further develop wafer-scale materials, and transfer the knowledge to industrial partners for commercialisation. An important immediate step for the AFRL research team was the recent opening of the AFRL-Cornell Centre for Epitaxial SolutionS, or ACCESS. This Center of Excellence, led by Cornell University in partnership with AFRL, will give Cornell students and faculty the opportunity to work closely with AFRL researchers and laboratories. The knowledge base that grows out of ACCESS will go hand-in-hand with the ongoing AFRL efforts including the MBE research, resulting in a greater breadth of knowledge and expertise.